I’m opening this new thread to share with you my experiments and findings with the great WSPRlite I’ve got for my 2017 SOTA Sherpa award. 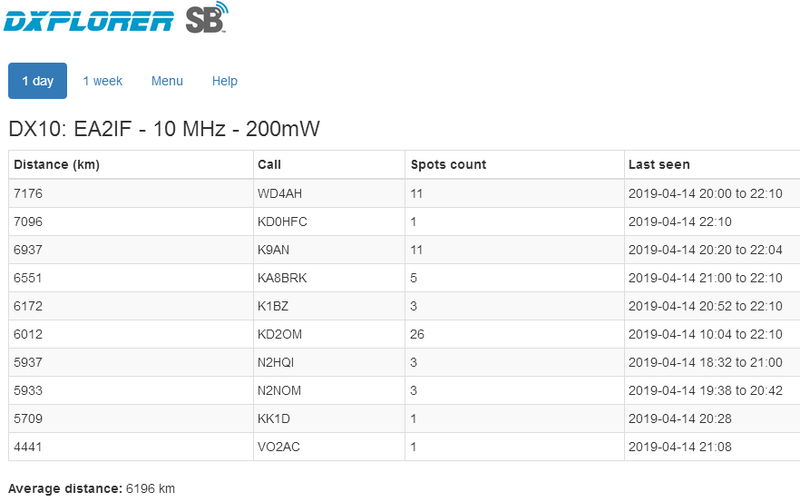 After a bit of struggling with laptops, I finally managed to communicate with the WSPRlite unit and program it today, so I started testing it with a preliminary transmission on the 20m band with just 200mW output to my random wire endfed antenna in the balcony. This is what I got from a bit more than 2 hours beacon transmission. The times on the table are UTC. Except for one spot from Norway, all the other spots come from North America. It’s clear that the location, the orientation of the balcony and the antenna set up work great towards North America. 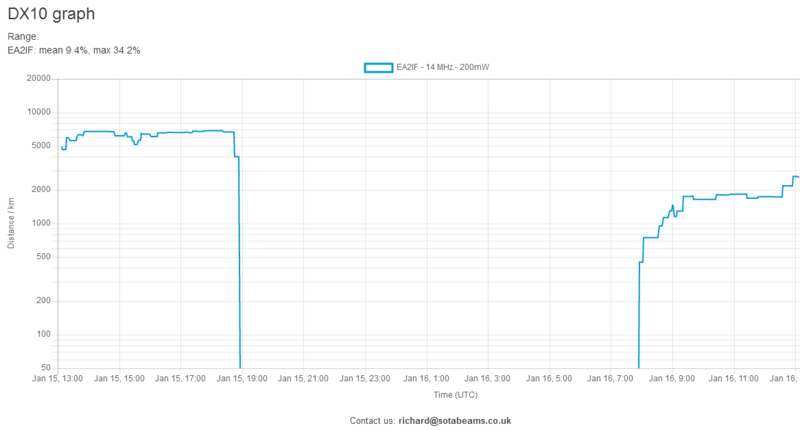 I had left home leaving the WSPRlite connected last evening but once back home, I found that the WSPRlite had stopped transmitting, probably due to a power shortage. Very likely due to excessive consumption when my wife and daughters probably connected everything (oven, kitchen, lights, toaster, microwave, washing machine…) all at the same time, as they often do, despite all my advises and warnings. So the last spot was at 18h04 UTC. On my return home at about 23h UTC, I put he WSPRlite back on transmission for the whole night and these are the collected spots this morning at 9h40 UTC. Interestingly I only got a single spot from Italy at 23h14 UTC and nothing else for the whole night until 6h46 UTC, when I got spotted from Bulgaria and then, from that time onwards, several other spots from different locations to the East (Bulgaria, Ukraine, Austria, Hungary, Romania) and the North (Sweden, Denmarc, Scotland) and also in Africa (Canary Is,). As the time passed by, the spots from the East disappeared and turned into spots from Germany and Holland. In this map, as well as all the spots from tonight and the early morning, we can also see all the North American spots gathered yesterday before the power shut down. I find these results very interesting and I share them here with you in the hope that so you’ll find it too. Let me show you the spots raised in the same time frame of 2 consecutive days using 2 different antennas in 2 locations 18Km appart. 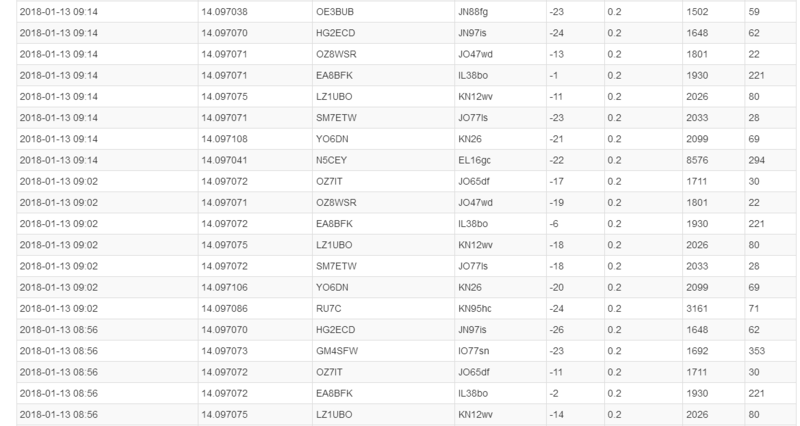 Up to about 19h utc of January 15th with Hy-Gain TH5-DX yagi 15m a.g.l. in QTH IN92CQ. At that point I stopped the WSPRlite. From about 22h utc of Jan 15th to the end of transmissions at about 13h15 utc of Jan 16th with my random wire endfed in the balcony up abt 25m a.g.l. in QTH IN92ET. The pattern of night propagation conditions total closure remains the same for the 20m band. Conditions open at about 8h utc and close at about 22h30. This can be a useful information to be bore in mind by overseas activators when planning their activity on 20m band looking for DX into EA. 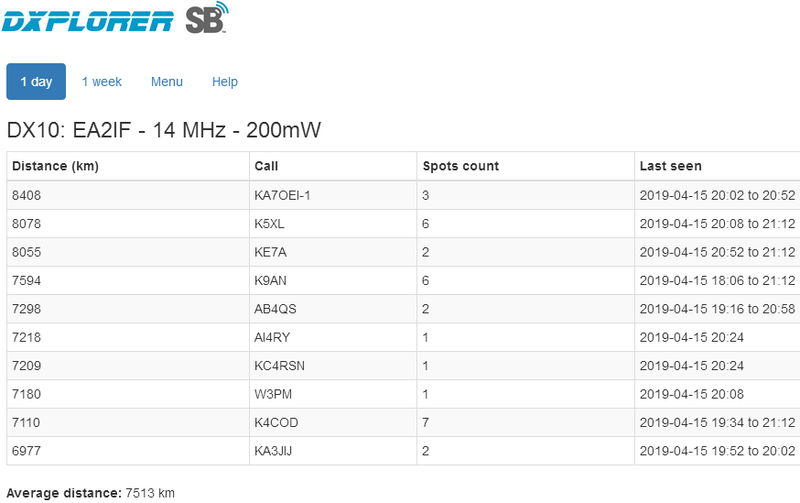 My WSPRlite will run on 30m tonight with the 14m long endfed wire in the balcony up 25m above the street level. We’ll see what we get tomorrow. 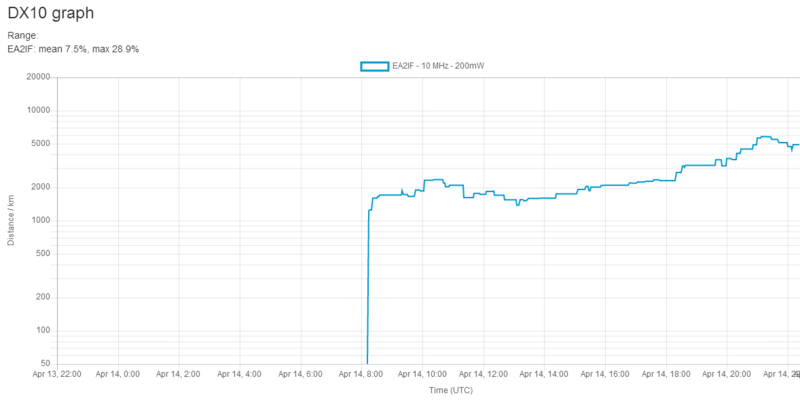 In my previous post 2 days ago, I told you I had left my WSPRlite connected to my antenna in the balcony, but upon my return home the following day for lunch at 13h utc, I found out that an unexpected event had occurred in the form of XYL accidentaly unplugging the WSPRlite power supply from the mains at about 9h utc. So I took the WSPRlite with me and I would take it after work to my house in the village South West of Pamplona to leave it transmitting on 30m band to one of the 2 suitable antennas I have there. I would decide right there which one. An 80m dipole works perfectly on 30m, as 3,5MHz x 3 = 10.5MHz, which is very close to where we are allowed to transmit on 30m band. 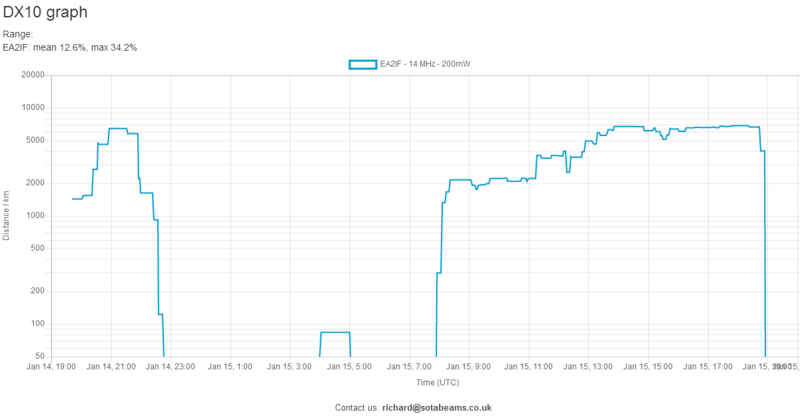 I yesterday left my WSPRlite running in the house connected to what I believed it was my 80m band inverted vee bazooka dipole and I returned to the rental appartment in Pamplona, but then I realized of a new unexpected event. 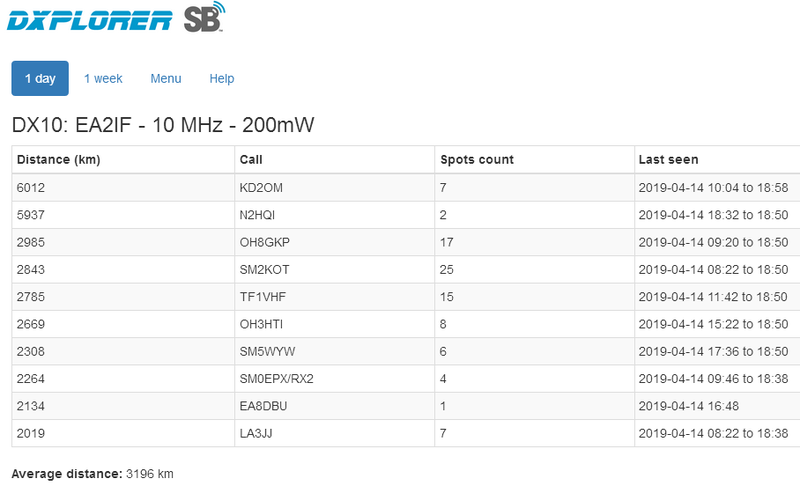 I had made a mistake and I had wrongly left the WSPRlite connected to my 40m band bazooka dipole instead of the 80m band one. Fortunately there wasn’t any risk of damage for the WSPRlite unit because I had previously adjusted my MFJ-986 tuner for perfect 1:1 SWR. 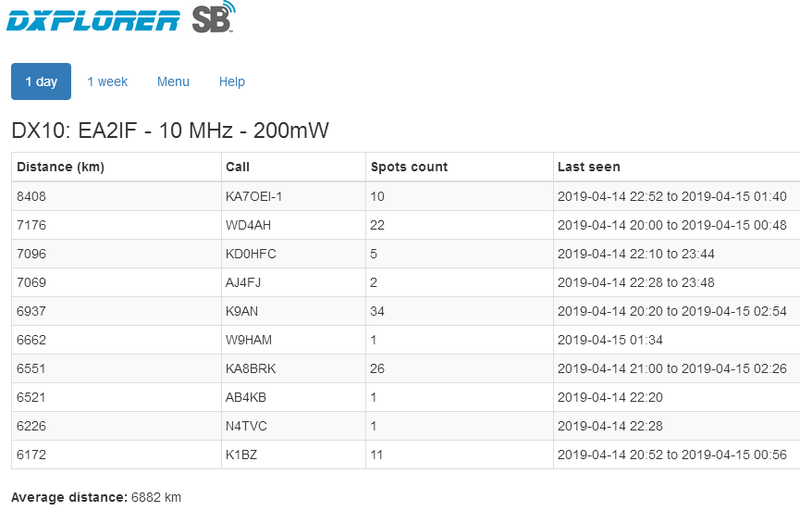 I have returned to my house in the village late in the evening today and I finally left the WSPRlite unit working with the 80m band bazooka dipole connected. The apex is about 14m above the ground and the ends about 5m above the ground. 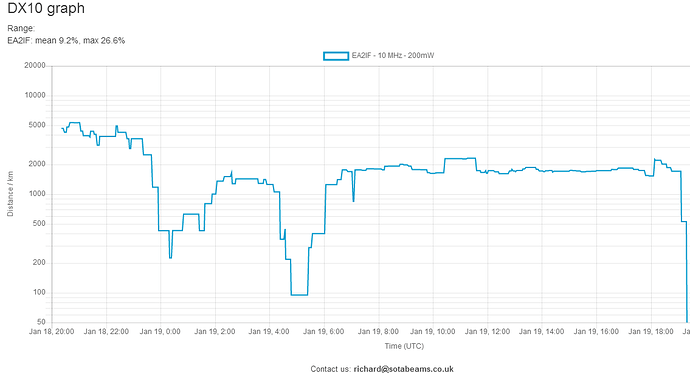 This is the graph of the WSPRlite transmitting 200mW on my 80m band inverted vee bazooka dipole. It certainly looks different to that of the previous day with the tuned for 1:1 SWR but still wrong antenna (for 40m). I left it again working on 30m this evening with a different antenna. This time with a Barker & Williamson BWD-90 inverted vee broadband folded dipole. The apex is again about 14m above the ground and the ends about 5m above the ground. The predominant direction of both the 80m band bazooka and the BWD-90 antennas is North-South, while that of the 40m band bazooka dipole wrongly used yesterday is East-West. 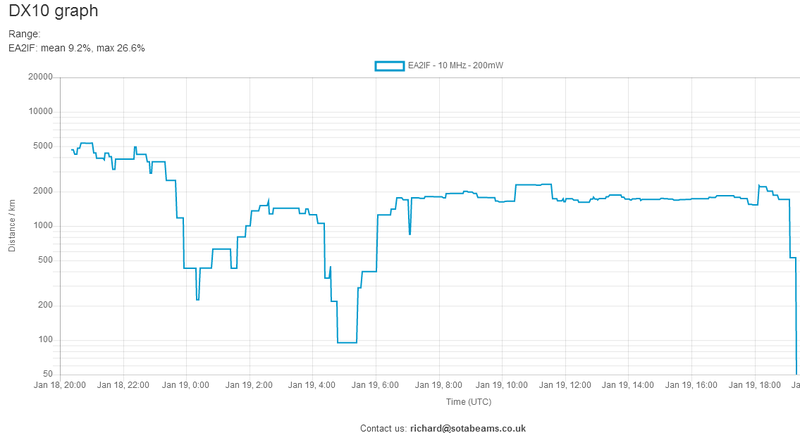 Following you can see the graph with the BWD-90 folded dipole on the 30m band. Notice that there has been a null from around 2 AM to 4 AM with this antenna. About the same null can be seen when transmitted with the inverted vee bazooka for 40m, from about 3h15 to 4h30 AM. 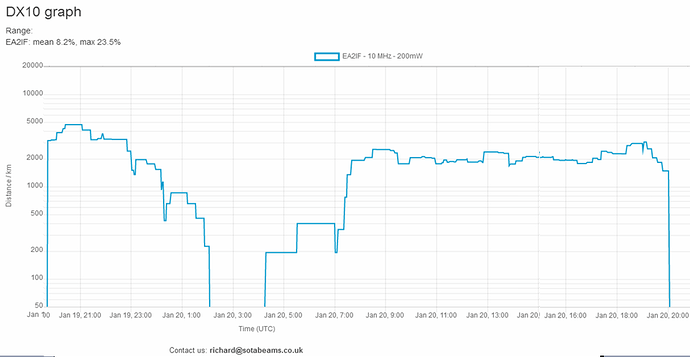 On the graph with the inverted vee bazooka for 80m, there’s not a null at night. And the first spot from North-America arrived at 10h04 utc from W2 call area. 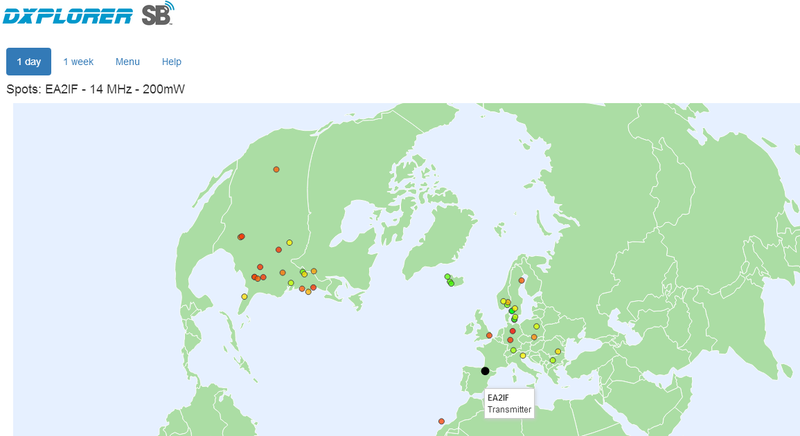 12h19 utc update: just 1 new spot from TF Iceland on the DX TOP 10 list. 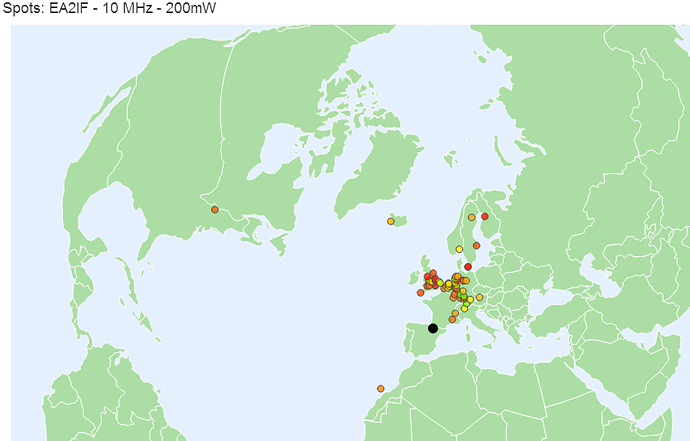 Thanks to DXPlorer and SOTABeams for the map and data analysis. This is 19h00 utc update. 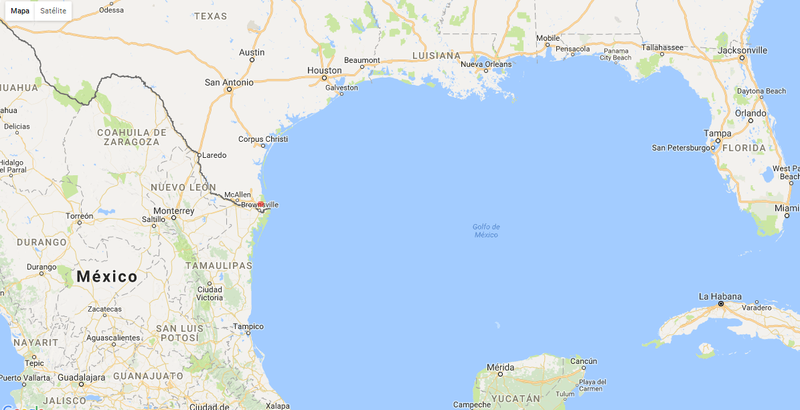 A new spot from North America (N2HQI) can be seen. The spots count is 7 for KD2OM and 2 for N2HQI. 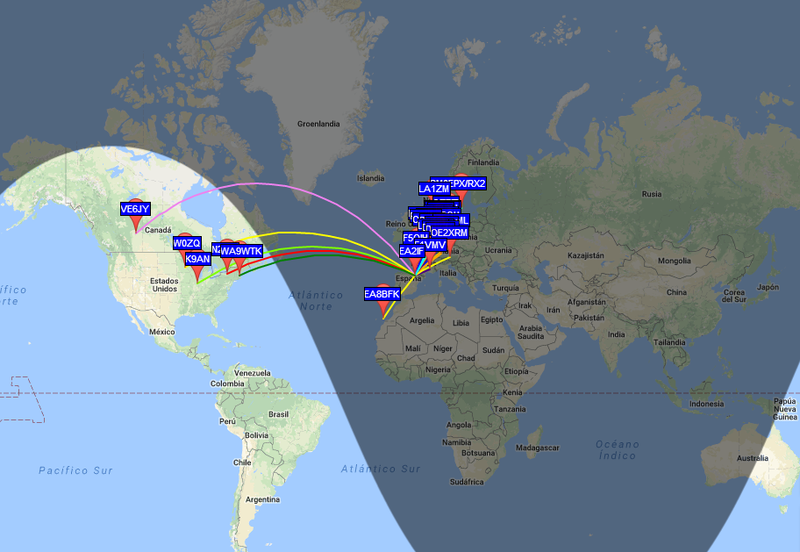 It looks like there might be a faint chance for DX S2S on 30m between the two sides of the Pond next April 20th during the Trans.Atlantic S2S event. 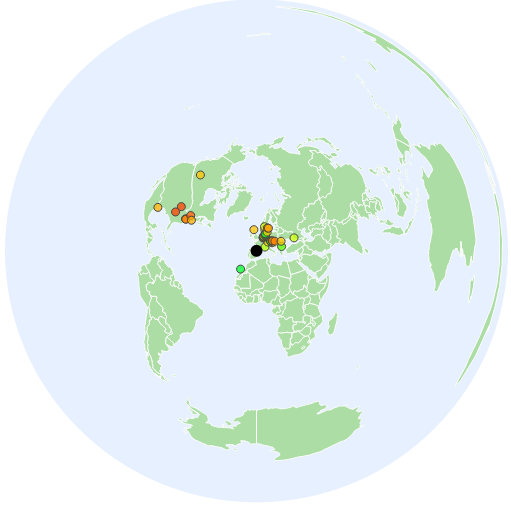 Thanks to for the map and data analysis. This is 22h15 utc update. Up to 9 different stations in Noth America have spotted me from W1, W2, VO2, W4, W8, W9 and W0. 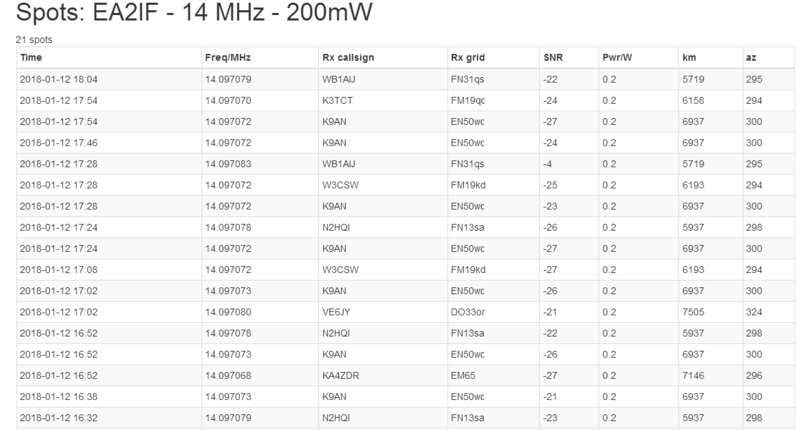 Propagation conditions do exist for great DX on 30m. The only problem is that conditions for DX are currently building far too late for most of the activators to remain in a summit. 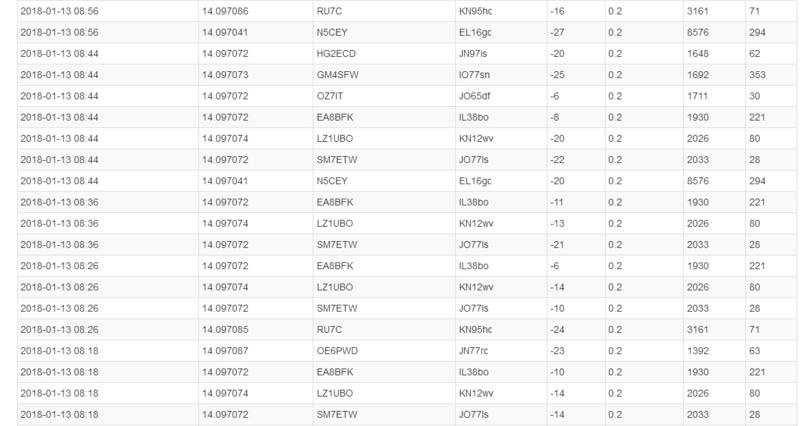 Yes, for what are normally considered “daytime bands” both 20 & 30m have been opening into the evening the last few days. As you say, this is unlikely to help this coming Saturday however as in Europe it’s UTC+2 making these DX windows too late unless an activator is camping overnight on a summit. This is 05h00 utc update with the full day loop finally closed. 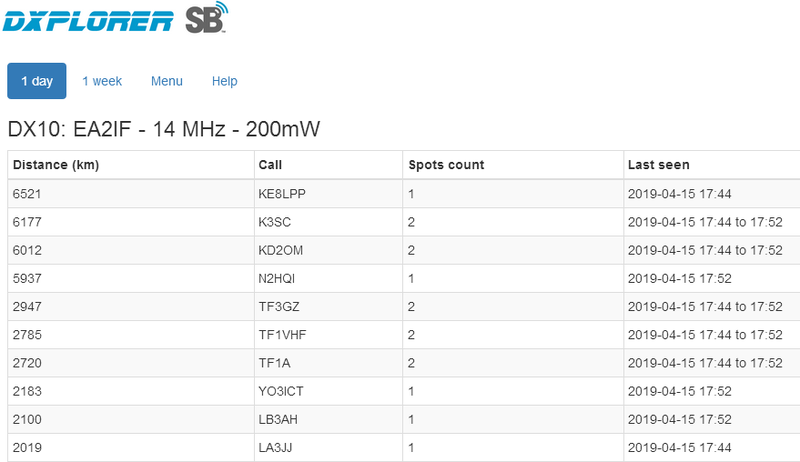 Starting a few minutes before 23h utc, we can see up to 10 spots from a station in W7 (KA7OEI-1). The DX10 table is fully made up with USA stations now. 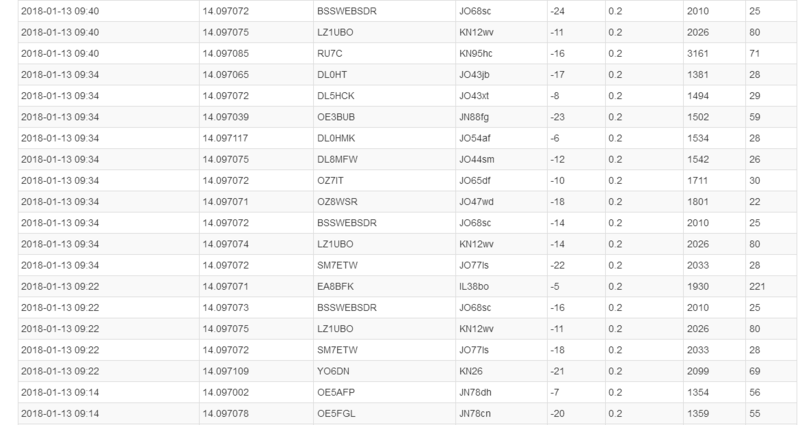 It’s been an interesting exercise and I hope I’ll be able to repeat it on 20m soon. 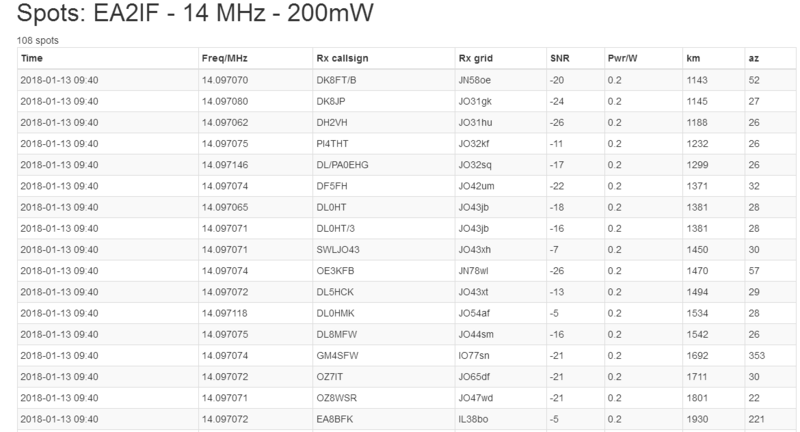 A new propagation testing exercise has just started for the 20m band at 19h44 (local) = 17h44 utc. My WSPRlite has started its transmissions using the same 200mW output power into the same endfed random wire antenna in the balcony about 25m up from the street level, of course, after having tuned it properly for 1:1 SWR with a MFJ ATU. I’ll keep you updated of how things go over the next 24 hours or so. This is 21h21 utc update. 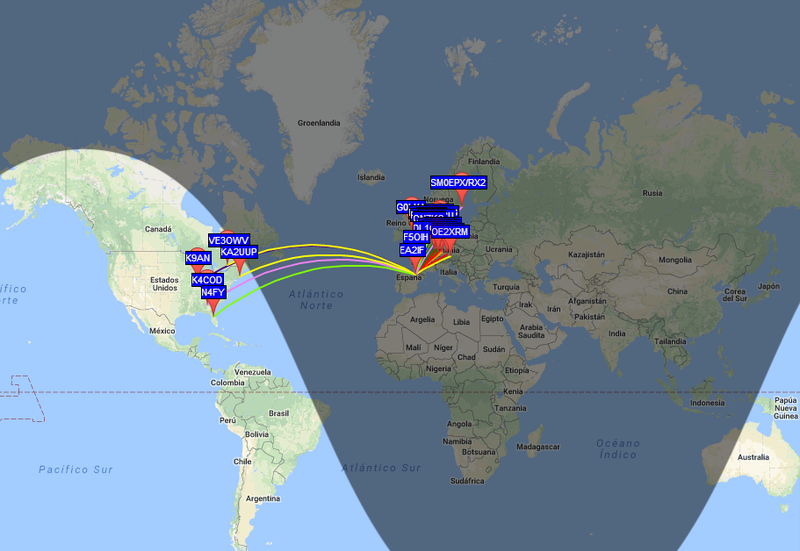 After nearly 3.5 hours transmitting, I’ve got plenty of spots from many US stations, from W1, W2, W3, W4, W5, W7, W8 and W9. The averaged distance reached is about 1300 Km greater than that on 30m by even 1 hour earlier time than yesterday. We’ll see how it goes tomorrow during daytime, but it looks like 20m will be the band to be for the Trans-Atlantic S2S event this Saturday.